Happy New Year, tea lovers! You probably know this already, last December my tea travels took me to Japan. In my previous post, you read about my tea adventures in Kyoto. There, I focused on one type of Japanese tea, matcha, given the proximity to Uji, the famous tea producing region to the south of Kyoto. In Tokyo, I finally explored the amazing variety of Japanese tea. In this post, I’ll tell you more about the Sakurai tea experience. If you’re doing only one tea thing in Tokyo, let it be that. 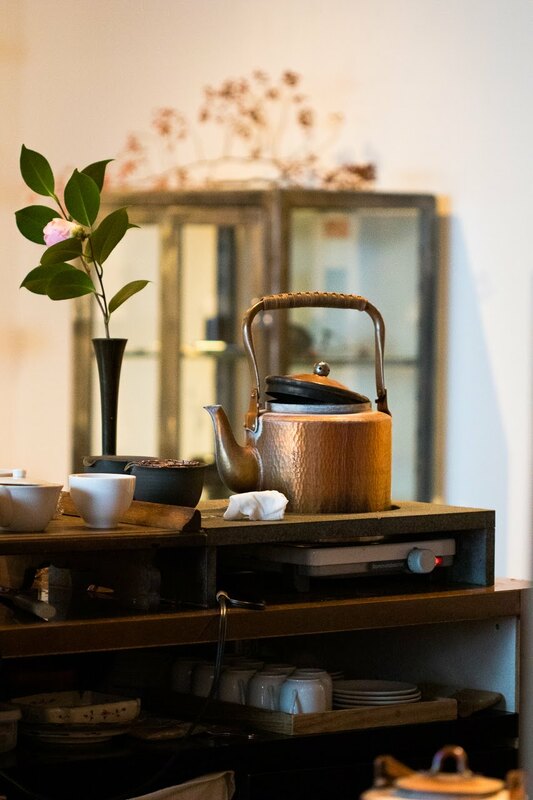 The Sakurai tea experience is a small tea shop and tea bar located in a smaller-scale, curated mall near Omotesando station. The tea bar seats 8 people. My husband and I chose the most expensive “tea course” (hand-rolled green tea, hojicha, bancha, matcha, light bites and wagashi for 6900 yen) and the most expensive “light meal course” (gyokuro, blended tea, chestnut steamed rice, bancha, matcha, light bites, wagashi for 5800 yen), but there are many other less expensive tasting and pairing options. The gyokuro and hand-rolled green tea were steeped in a shiboridashi (the Japanese version of a gaiwan but spouted) with very little lukewarm water (30-40°C / 86-104 F) for 3 minutes. This method yields a very concentrated shot of pure flavor. The hand rolled green tea leaves were gorgeous, I had never seen such skillfully made hand rolled sencha leaves, the liquor had a distinct scent of iris flowers and exquisite savory notes on the palate. The gyokuro (from Shizuoka prefecture) was an intense savory shot, with just the slightest edge of astringency. Both yielded 3 steeps. Such a treat. They were paired first with slightly sweet natto (fermented soybeans) and then with sesame and kinako (roasted soybean flour) wagashi sweet confections. 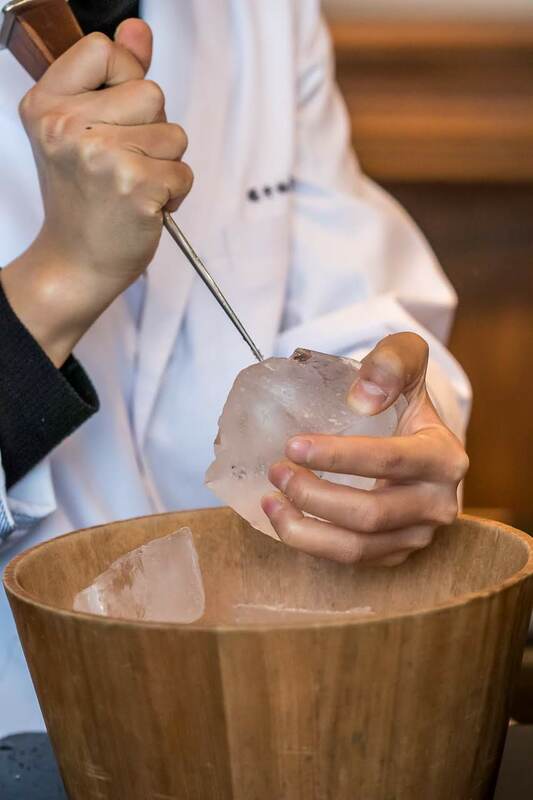 The same gyokuro and hand-rolled green tea leaves were brewed once more, served iced and scented with fresh yuzu peel. They were brewed warm and then chilled over hand carved ice cubes like you would with a cocktail (vigorously stirring and swirling the tea with the ice cubes). The yuzu peel was twisted on top to express the essential oils and then dropped into the tea while chilling it. The yuzu gyokuro still tasted very savory, the hand rolled green tea had notes of jasmine blossoms on the nose and on the palate. They were paired with tofu, sweet red beans and miso. Delectable is an understatement. Lastly the gyokuro and hand-rolled green tea leaves were served to be eaten as a salad, the hand-rolled green tea dressed with pink salt and the gyokuro with ponzu sauce (a citrus based sauce similar to a vinaigrette). Pure bliss. Then I got to choose which tea leaves were going to be roasted and made into hojicha and I was recommended tencha (the tea that is ground into matcha) stems. They were roasted in one of those clay roasting pot with a side handle. The aroma was intense. The tea was savory, toasty and slightly smoky and it was paired with smoky pickles. Mouthwatering is a good way to describe it. After that, a Sannenbancha tea was paired with chestnut rice and a whole anchovy. It’s a very unique tea, starting from its appearance. It’s made of tea branches, not twigs. It’s herbaceous and sweet. I found a very interesting description and explanation that might shed some light on this unique type of tea. Sannenbancha was followed by Iribancha. Iribancha is a type of tea from Kyoto, and it’s also known as Kyobancha. It’s smoky with a pungent note and it was paired with pickles. “After the first tea picking of the year, leaves, stems and small twigs from the lower portions of the tea plant are collected, steamed, dried (but not rolled), and roasted at high heat. The result is an unmistakably unique smoky flavor and aroma, somewhat similar to the smell of a campfire”. (That’s how Ippodo explains how this tea is made). Last but not least the experience was rounded off by a bowl of ceremonial matcha and wagashi. A crepe with gingko nuts and red bean paste and chestnut jelly. The matcha had mild sweet and savory notes on the nose and a smooth, savory taste without any bitterness. When the 2-hour-long experience was over I was so happy and fascinated and satisfied that I wanted to start over and try many more teas. I can’t recommend it enough.